THE SECRET LIFE OF PETS. (DVD Artwork). ©Universal Studios. Ever wonder what your pets do while you’re away? Although Illumination Entertainment’s “The Secret Life of Pets” offers some comical insight into that age-old question, the animated feature plays more like a homage to Pixar’s “Toy Story” than anything else. Rather than focusing on what the common household pet does during the hours home alone, the animated feature simply touches upon that before sending its star, a pampered terrier named Max (voiced by comedian Louis C.K., “Louie”), on an adventure through New York City. Just like Woody in the original “Toy Story,” Max feels threatened by his owner’s new object of affection—in this case, an oversized rescued pooch named Duke (voiced by Eric Stonestreet, “Modern Family”)—and doesn’t want to share her precious time with him. Determined to send Duke back to the pound from which he came, Max does everything in his power to show his owner Katie (voiced by Ellie Kemper, “The Office”) that a Manhattan apartment is no place for a large, shaggy dog. Although Duke tries to get along with Max at first, he knows his days are numbered at the pound and decides that the only way to get his happily ever after is for Max to be out of the picture. When his plans to abandon Max in an alley go astray, the unlikely duo find themselves on the run from Animal Control and a gang of sewer-dwelling abandoned animals led by a homicidal rabbit named Snowball (voiced by Kevin Hart) while trying to get back home—together. Just like many of its animated stars, “The Secret Life of Pets” is pretty cute, filled with memorable characters (besides Max, Duke and Snowball, there’s also a love-struck Pomeranian named Gidget that’s voiced by “Parks and Recreation” star Jenny Slate who is sure to win over viewers’ hearts as she sets out on a rescue mission to track down Max once she discovers he’s missing) and plenty of laugh-out-loud moments. And yet given how memorable the film’s trailers were, audiences can’t help but feel slightly disappointed when the pets take Manhattan and the concept of seeing them at home without their humans around gets abandoned for a storyline that feels all too familiar. Those who saw “The Secret Life of Pets” in theaters will be familiar with “Mower Minions,” as the comical Minions-doing-yardwork-to-disastrous-results short featuring “Despicable Me’s” breakout stars preceded the film in theaters. “Norman Television” follows “The Secret Life of Pets’” lost guinea pig Norman (voiced by the film’s co-director, Chris Renaud) as he watches the various tenants of his apartment building through the air conditioning vents like they’re on TV and eventually moves from spectator to participant to foil a potential murder. “Weenie,” meanwhile, is a musical short about how awesome it is to be a weenie featuring the hot dogs from the sausage factory Max and Duke visit during the movie. Not only is the song cute and comical, but it’s also quite catchy, so be forewarned that viewers might find themselves humming it to themselves long after watching the short. There’s also an extra that quickly goes over “The Making of the Mini-Movies,” featuring the filmmakers talking about their respective shorts. Viewers will learn that all three mini-movies were made in Paris, how “Norman Television” references the Alfred Hitchcock classic “Rear Window” and that “Weenie” was inspired by those classic “Schoolhouse Rock!” music videos. 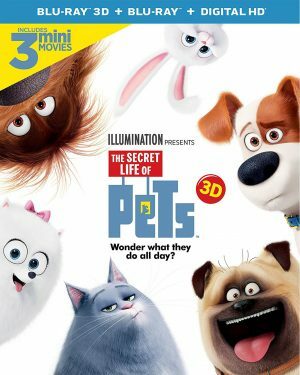 “The Humans That Brought You ‘Pets’” is a collection of quick interviews with the team behind the film—Illumination founder/“The Secret Life of Pets” producer Chris Meledandri, producer Janet Healy, directors Chris Renaud and Yarrow Cheney and writer Brian Lynch—that viewers can either watch individually or altogether via a ‘Play All’ option. Viewers will not only hear Meledandri talk about each crew member and the inspiration behind the film, but also hear from each person about which specific storylines and character traits came from their pets. For instance, Renaud talks about how losing his own guinea pig inspired Norman’s tale, while Cheney talks about how his pet bird Smokey once flew away only to return two months later, leaving him wondering just what the bird had been up to. “Animals Can Talk: Meet the Actors” shows behind-the-scenes footage of Stonestreet, Hart, Slate, Lake Bell (who voices Chloe the cat) and Bobby Moynihan (who voices Mel the pug) recording their dialogue for the film and talking about what drew them to the project. Hart comments during the extra on how his voice is usually “too tough” for animated films, but was edgy enough for a fluffy white bunny with a militant spin. It’s funny to see how calm and collected Hart is recording his lines compared to how enthusiastic Slate is recording hers. “All About the Pets” is a hilarious featurette featuring Hart, Stonestreet and animal trainer Molly O’Neill where O’Neill shows the two stars of the film several different animals and talks about them. The comedy of this extra comes from the fact that O’Neill asks Stonestreet to hold all of the cute animals, like a ragdoll kitten and a chinchilla, while Hart is asked to hold the more exotic, dangerous animals, like a rose hair tarantula and an albino Burmese python. In between the laughs, viewers will learn some interesting facts about the animals, like that a chinchilla has 60 to 80 hairs per hair follicle and that hens talk to their eggs before they hatch. Viewers will also learn that Hart apparently studied bunnies for five months to get into character as Snowball. “Hairstylist to the Dogs” is another funny extra featuring Stonestreet and pet stylist to the stars Jess Rona as Rona teaches Stonestreet, as well as the viewers at home, how to properly groom their dog. What makes this extra so funny is Stonestreet’s patient pooch, Denzel, who looks absolutely thrilled to be a part of the grooming session (note the sarcasm). While Stonestreet’s look for poor Denzel is comical by itself, it’s really the dog’s annoyed expression that steals the spotlight. Fans of Snowball’s will surely enjoy “The Best of Snowball,” a quick compilation of the bunny’s best lines and moments from the film, while “Hot Dog Sing-Along” is a brief karaoke-like extra featuring Max and Duke in the sausage factory while the hot dogs sing along to “Grease’s” “We Go Together.” There’s also a lyric video for “Lovely Day,” which gives a whole new meaning to the classic Bill Withers song as the lyrics appear on-screen alongside animations of the film’s lovable stars. Any pet owner will find themselves able to relate to Withers’ touching words: “When I wake up in the morning, love; And the sunlight hurts my eyes; And something without warning, love; Bears heavy on my mind; Then I look at you; And the world’s alright with me; Just one look at you; And I know it’s gonna be; A lovely day.” Every day you get to spend with your pet by your side truly is a lovely day. Both the DVD and Blu-ray release also include three Fandango “Brian the Minion on ‘Pets’” promotional shorts shot “Mystery Science Theater 3000” style with the Minions watching various scenes from “The Secret Life of Pets” (as well as “Norman Television”) and annoying Brian the Minion with their actions. Of course, it’s always poor Brian who gets kicked out of the theater instead of them. The Blu-ray/DVD Combo Pack with Digital HD also includes two exclusive making-of extras. “Anatomy of a Scene” goes over how each scene comes to life, from animating the genuine animal movements and grooming each character’s hair to lighting and compositing the finished scene, while “How to Make an Animated Film” takes a look at just how collaborative working on an animated film is and the extraordinary army of creative talent it took to make “The Secret Life of Pets.” Viewers will also learn the key to the film’s success from straight from the mouth of Kevin Hart: that it looks as good as it looks because they added him to the cast. Unfortunately, Louis C.K. is nowhere to be found on any of the extras, which is a shame considering he voiced the star of the film and it would have been interesting to hear what drew the usually R-rated comedian to the family-friendly project. Nevertheless, there are plenty of entertaining extras included on both the DVD and Blu-ray release of “The Secret Life of Pets” to make it a worthwhile stocking stuffer for any animal lover on your gift-giving list. 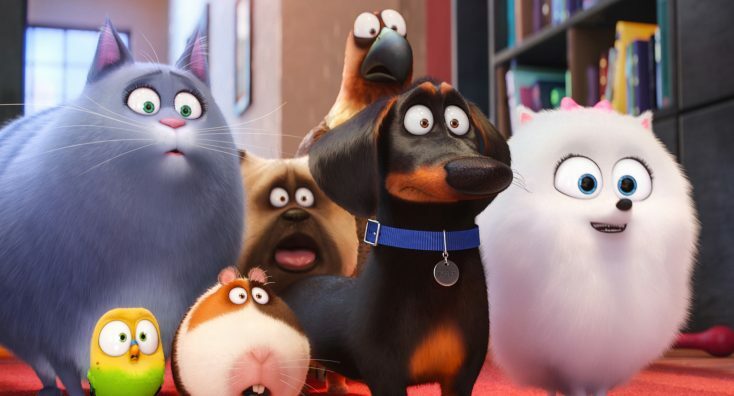 Although the film doesn’t quite reach its full potential, it looks like Illumination has another successful franchise on its hands, as this is one group of pets moviegoers will want to welcome into their homes time and time again. Previous PostPhotos: ‘Florence Foster Jenkins,’ ‘Ben-Hur,’ ‘Duck Dynasty’ and more on home video … plus a giveaway!